Live Show Poster Design Contest! 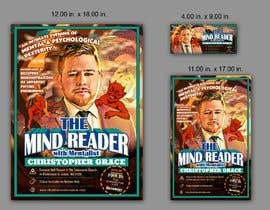 I am looking for a new poster for some upcoming performances of mine. The poster must have 11x17 , 18x24 and 4x9 sizes for various printing needs. The .psd file needs to be included as the venue location may change and I'll need to update the location info as needed. Attached to this contest are examples of the look and style I'm going for. Any questions please feel free to ask. 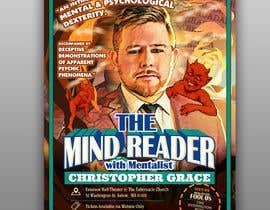 "The Mind Reader: with Mentalist Christopher Grace"
"An intimate evening of mental & psychological dexterity. Accompanied by deceptive demonstrations of apparent psychic phenomena." "Tickets Available via Website Only"
"Seen on Penn & Teller: Fool Us!, The Huffington Post, & Boston Magazine"
Once the winner is announced from this contest, I would like to possibly work further with you to continue design work in the form of websites, flyers, logos, etc. Also attached are pictures of me to use for the poster. Please do not any other pictures from my website other than the ones attached here. I've also added a couple of elements to possibly include in the poster. Also - I will guarantee this contest once a good amount of entries have been made that follow the above guidelines as close as possible. I will submit an entry soon..! please check entry #27 . Thank you! Just wondering, can I edit the photo? or it needs to be that position, and "emotion"? Can I pick a pose? or you need to be standing? I would love to hear some feedback to start working. please check entry #25 . Thank you! is this for printing or digital purpose ? Working. wait for my entry. hi could you please let me know what is these lines for "Seen on Penn & Teller: Fool Us!, The Huffington Post, & Boston Magazine"